Hi TT&J readers! It’s Taryn from Design, Dining and Diapers and it’s great to be back! Do you ever find yourself pinched for time when it comes to holiday decor? Each year I start out the holiday season with a million new ideas and I end up only completing a few of them because the season just seems to fly by. Well, I’m here today to share a quick and easy holiday decor project that can work for both Thanksgiving or Christmas, depending on how you like to decorate for each holiday and takes no time at all. Need a vase filler? Or want to glam up your fall decor? 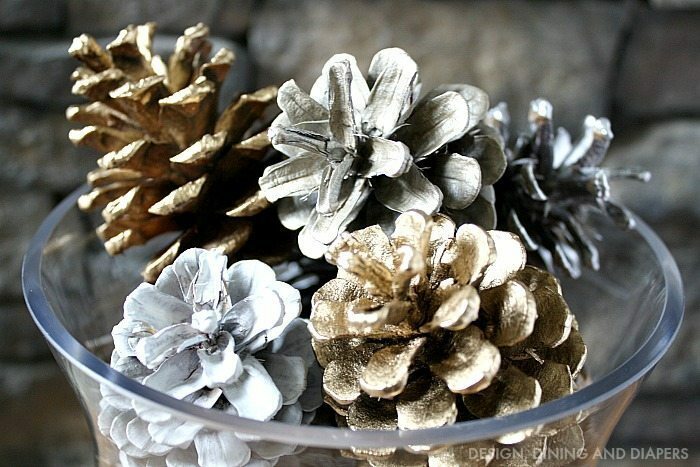 Try spray painting pine cones in metallic colors to instantly give them a facelift for the holidays. The result? 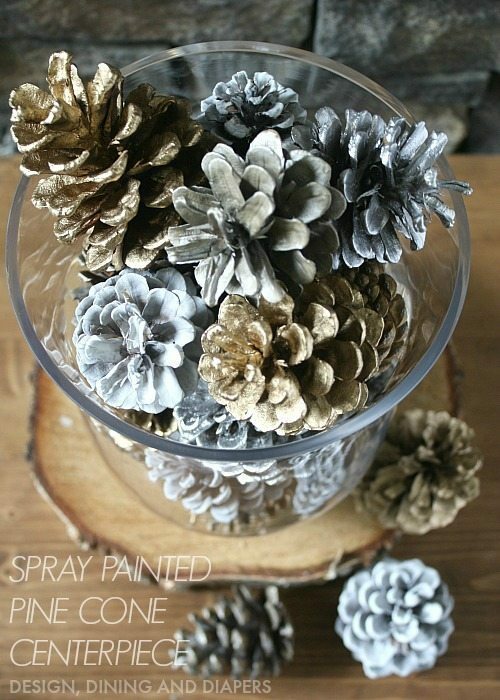 A beautiful spray painted pinecone centerpiece. This is a project that my mom and I used to do when I was a kid. Every year I would give handmade holiday gifts to my aunts and uncles and grandparents and one year we gathered HUGE pinecones from the tree at our cabin and I spray painted them different colors to match each recipient’s personal style. It’s always fun to receive a gift made just for you! For this project, I used small pine cones that I actually picked up at the dollar store. You can also find them at the grocery stores around this time of year. I laid the pinecones out and painted them in metallic gold, metallic silver, white and mocha. Let them dry overnight and then put them to work. There are so many things you can use them for, fill a hurricane vase for a centerpiece…. … or add them to a silver bowl on a shelf or vignette for a more subtle look. What color would you paint them to fit your personal style? Thanks for having me over today! Taryn has such a unique, elegant style. I love how she decorates for all the holidays using neutral colors and tones! Here’s a post about Neutral Christmas Decor to give you some great ideas. I also love a quick dessert idea. This Pumpkin Angel Food Cake with Lemon Drizzle looks perfect for fall! Her Rustic Fall Centerpiece ideas would be so pretty for Thanksgiving! Add the metallic pinecones, and you’ve got an amazing centerpiece perfect for entertaining! 30 Chicken Recipes for Your Crockpot!! 10 Minute Gift Idea – Tic Tac Toe Game! Thanks for the wonderful ideas! There are many ways you possibly can go about validating the market for your design ideas. Send the application type and demand draft at 32, Dr.
Lal Mohan Bhattacharya Road, PO – Intally, Kolkata-700014 by means of speed post. tais coisas, então vou informar ela. weird when browsing from my apple iphone. I’m trying to find a theme or plugin that might be able to correct this problem. I am regular visitor, how are you everybody? This post posted at this website is really nice. If someone was doing woodland theme that would be cool with the pine cones. I’ve done the pine-cone thing, but I get a little cinnamon oil from the candle section of the dollar store and put a drop on each one afterward – makes the whole arrangement smell nice and wintery! Simple and elegant. I love it! Find here the best school public address system that’s now in stock and currently available. Get it now!